I was VERY surprised to find a box from Crackin' Wax on the table when I came home (early, I might add! Wahoo!!) from work. I mean, I knew the recent group break cards had been mailed, but WOW! The Indians were long taken in the break, but I wanted to help out with the charity and snag some cards in the process. Having been to see the Rockies a few weeks ago, I opted to add them as my break team. But, that is not the reason I chose them. Well, not the main one, anyway. You see, my son just graduated from High School this year. He has become an instant fan of Todd Helton after seeing him play and after a few other interesting tidbits that my son just couldn't ignore. 1) Todd Helton and my son share the same initials. 2) Both Helton and my son play first base for their respective teams. 3) Both Helton and my son wear the Number 17. 4) Helton was drafted in the year my son was born. 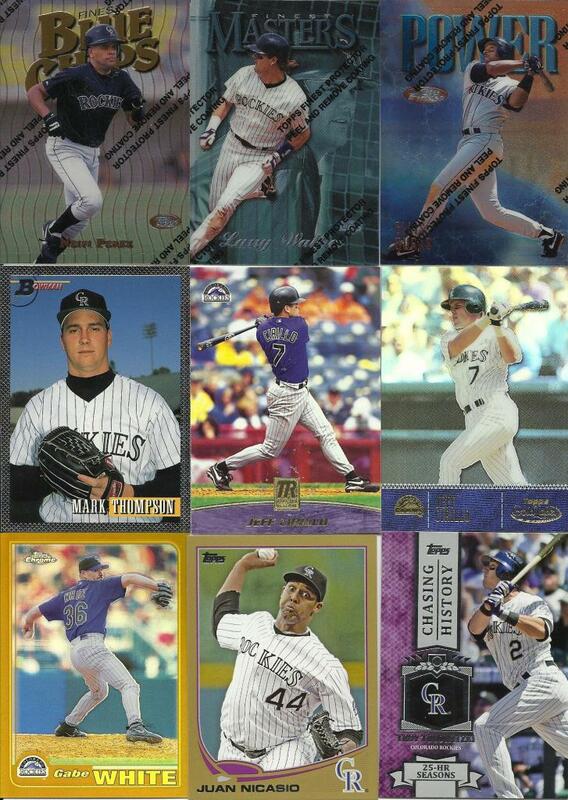 So, since my son has decided to start following Helton, I saw a chance to hopefully snag some cards for him. I did manage to get a handful (literally, five). He'll enjoy those for sure! I also snagged a nice pile of Rockies that I'll use for trade bait, giveaways, or whatever. I picked nine cards to scan that represent the variety of cards in the break, but mostly show the "hits" of the team's cards I pulled in the break. If Nicasio is trying to look scary, he missed. What a look! The Finest will be peeled for sure. I don't know the current thinking on protective coatings in general, but I've never liked them. I peel them off everything: cards, computer fascias, cell phone cases, remote controls, whatever. If there is a stupid protective coating, it is outta here. Thanks to Crackin Wax for holding the break! Mostly, though, thanks for giving a part of the proceeds to charity. That rocks! I'd be happy to send your son a HEALTHY stack of Todd Helton to get him going if you wouldn't mind parting with some of this break. Let me know. Thanx. I'll send you any of these Rockies ya want! Heck, I'll send them all. Want me to count them, list them all, etc? Or just send 'em your way? Just send 'em, it'll be easier. There will probably be a couple I don't need, but all the Heltons are from the dupe box, so it will definitely be a net gain in cards I want.